Maytag is a leading producer of premium home appliances including refrigerators, freezers, ranges, ovens, microwaves, dishwashers, washers and dryers. 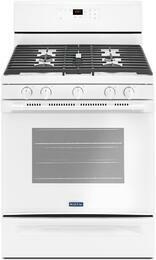 Maytag offers premium 30” white ranges with varying features and innovative designs. White appliances offer a clean, classic aesthetic and match virtually all kitchen designs and decors. aytag 30” white ranges are available as freestanding models for flexible installation options. Decide which fuel type makes sense for your home: electric or gas fuel models. Design your preferred cooktop configuration: four or five burners in sealed or smoothtop burner types. Maytag 30” white range oven feature options include convection cooking, storage drawers, self-cleaning modes, and delay bake programs. LP conversion kits are included with certain ranges. Select models include key features such as Power™ burners which allow for a slow, even sauté or the intense heat for a seared, juicy steak. The Precision Cooking™ system uses sensor heating to ensure even cooking for every meal. AquaLift™ self-cleaning technology ensures a clean oven without harsh chemicals. Digital display panel offers precise temperature, timer and cooking program control. 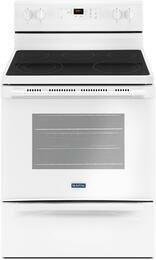 Complement your 30” white range with one of Maytag’s other high-quality products. For powerful and efficient ventilation choose a premium Maytag range hood. Equip your home in convenience and style by building a complete Maytag kitchen appliance package. Check out Maytag rebates for additional savings!